VATICAN CITY, October 4, 2018 (LifeSiteNews) — Cardinal Robert Sarah was elected last evening as a member of the Information Commission responsible for disseminating news on the Vatican Youth Synod, but has declined the position “for personal reasons,” it has emerged. Cardinal Sarah, of Guinea, is also the author of two acclaimed books: God or Nothing and The Power of Silence. I greatly respect Card. Sarah. If he declined this role, then God bless him. Who would want to be associated with dissemination of pre-cooked news? My own copy in English of Robert Card. Sarah’s book, The Power of Silence: Against the Dictatorship of Noise. This entry was posted in ¡Hagan lío!, Synod and tagged Robert Card. Sarah, Synod. Bookmark the permalink. Incredible book. Can’t recommend it enough. Increased my appreciation for the Extraordinary Form and its long silent stretches. Should be required reading. Well, we know who won’t be invited to any of the Synodal festivities. 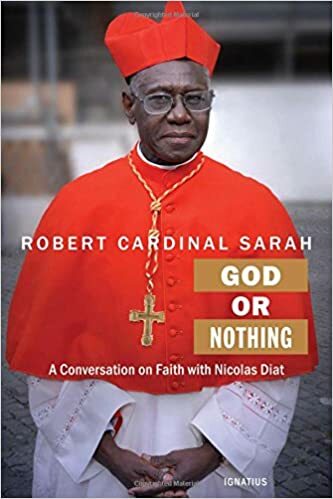 I suspect the world could one day benefit if one day Cardinal Sarah was the chosen from another kind of election with a lot of cardinals. All good name choices for a man of God in a most holy role. Add Leo to the list. Cardinal Sarah surely recognises that he would waste his time and compromise himself through association with something with a pre-determined outcome. The Power of Silence is full of meditation- worthy sentences on every page. This news troubles me. We may never know why he declined. I hope Archbishop Chaput isnt left alone. Me negative. God wants me positive. After seeing how the first synod on the family went, some of us signed a petition for a boycott of the second synod on the family. The second synod went as planned, and we got Amoris Laetitia, which some of Francis’ team says does not change doctrine at all, and some others of his team say changes everything and gives us a new paradigm. If the new paradigm guys are right, then church teaching has changed with the votes of a small gathering of bishops and cardinals. It wasn’t like all a Vatican council called all of the bishops and cardinals together to vote on these changes; it was a small portion of the hierarchy. Of course we know that the Church can’t actually change her doctrine, but that doesn’t mean that men aren’t trying to do just that, and short of being able to, trying to give the perception that it has happened. So, in the face of a small, carefully selected group of bishops picked for their willingness to comply with the new paradigm, and synod procedures manipulated to shut down dissenters, what options do men like Cardinal Sarah have other than to remove their name from the charade? CanukFrank: Happy, glorious Easter! Thank you, Fr. Z, for these podcasts. (Hopefully , I’ll be in a position to donate one of these days). SanSan: Amen Amen! Alleluia Alleluia!! ! HE IS RISEN! One of my best Lents Ever. Thank you Jesus! Happy Easter Fr. Z and all who come here. acardnal: Christ is risen! He has risen indeed! Lurker 59: Happy Easter, Fr. Z. Thank you for seeing us through Lent to Easter morning. Semper Gumby: Thank you Fr. Z, and a Happy Easter to all. Kathleen10: That is delightful about the bees, it is super happy news, thank you for it. A blessed and happy easter to you and all, Fr. Z.
Suburbanbanshee: I’m home sick, and just listened to the Exultet from the National Basilica. They also had an Easter candle that looked like a young caber! Gab: My first Easter (Latin) Vigil last night. Thank you for this “rep lay” , Father Z and the explanatio n. I understand a bit more today! capchoirgirl: HyacinthCl are: Wow! Midnight?! That’ ;s impressive . The Vigil I go to starts at 8:30 and we’l l get out around midnight, probably.